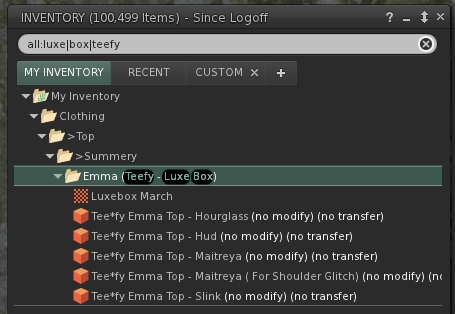 Another very common problem I run into is knowing that I bought something that would work perfectly with the outfit I’m putting together but I can’t find it so I just hopelessly keep poking my inventory with various search terms hoping the elusive accessory will magically appear among the search results. 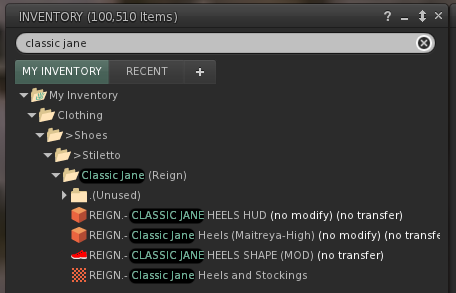 While those are the shoes I'd want to wear, not all the items in that folder are shown (they come with mesh stockings and a colour picker HUD that I need as well) and of course the filter prevents them from showing so I would have to clear the search, scroll down to the folder and then wear it all which always feels rather tedious and broken. While this is the top I wanted to wear, again I can’t get at the actual items I want without clearing the search and some scrolling (and waiting since it does take a noticeable amount of time for my 100k+ inventory to get unfiltered). But wait… we already have a solution for this in Catznip right? We can simply right-click on that folder and pick “Open In / New Tab”. And ta-da, problem solved! Right? We still have the exact same search we had a moment ago, in the exact same inventory tab, but now I can easily see all of the items right there and just wear them! Tip: you can actually hold down Ctrl and double click the folder to toggle its inclusion in the current search so you don’t even have to move through the menu maze! As you saw, the menu label reads “Current Search” which means that once you click little (x) to clear the current search the folder won’t keep showing up in all of your subsequent searches. You can also tell from the other three (currently disabled) options that I’m thinking about expanding on this option, but that won’t currently be going out with the first release since I’d like to play with it a little bit first. This wraps up our second day of inventory feature teasers and hopefully you have a good (starting) idea of what to look for; even if none of the above made sense I’ll bet that at one point or another you’ll be searching your inventory and just wish you could see everything that’s in that folder without clearing your search and that’s when it’s this feature’s time to shine.